It took me about an hour after I took this photo to finally remember who this young man reminded me of…..a modern Thelonious Monk(below). Does this guy work at Domenico Vacca on Madison? Either way he of course looks good. The Brown suit is always a challenge in terms of shirts, ties and shoes. This guy has pulled it off superbly I must say. His look is really as good as one could see anywhere. A great sense of adventure in a suit…?! How much I prise people that are able to create a style of their own with very “standard” pieces. This dude definetly knows his style above the mass trends. Bravo! Great look and a well exposed photo. Wow, sharp look – and the light in your picture is amazing! he is quite striking. great style and execution. this is how i would like to wear my suit.leaves me envious. picture is beautiful! Holy crap, he’s perfect. Not many people can make pink and brown look badass. this guy is really cool. untouchable. (except for those silly shades). monk was cool in an other worldly kind of…didn’t give a damn…way. miles may have defined “jazz cool”, but monk embodied it, didn’t know it, and wouldn’t have cared. sart, thanks for that connection. The slim fit works well, as do the pinstripes, but the hair makes his look. Elegant, refined; what great style! Perfect is the word! Brave hair and colour of shirt. And the fit of the suit! Lovely! That suit is like a second skin on him. The white Ipodcabel working as the perfect accessory! He’s devine. It’s not just the clothes, it’s the way he carries himself that makes it all work so perfectly. You’re right, Sart, he looks like Thelonious. I’m going to have to listen to some of his music tonight…and dream of that delicious man. He looks suave! Very stylish color combination. And the funky hair makes this look so modern! I love his skin colour! The glasses are a bit SuperFly, thus seem incongruous, but he looks great in them. They’re not really “Monk” in looks, but they certainly are in attitude. Awesome. And what was playing on the iPod? This is the slickest customer I’ve seen on here. He exudes fly. The photograph is beautiful too… I really like how the background is washed out like that. I’m curious though… what do you think makes this less than perfect? That’s a really good look. I love it when men know how to dress properly and especially when they get a good fitting suit. this may be one of my favorites ever, sart! Nice waisted jacket and the pocket square/shirt combo work well. Blue (?) stripes on the shirt are the added touch. But what is the cut of the pant, and does he have a cuff or not, “mid-atlantic” break, American break or Italian? Proportion to the jacket is essential here. Please include the shoes as they could make or break this look. Yes, pink and brown seems to be a very popular colour combination, but he certainly wears it well. Great fit, great colours, great hair and great confidence. And I personally really like iPods against suits. Stunning. 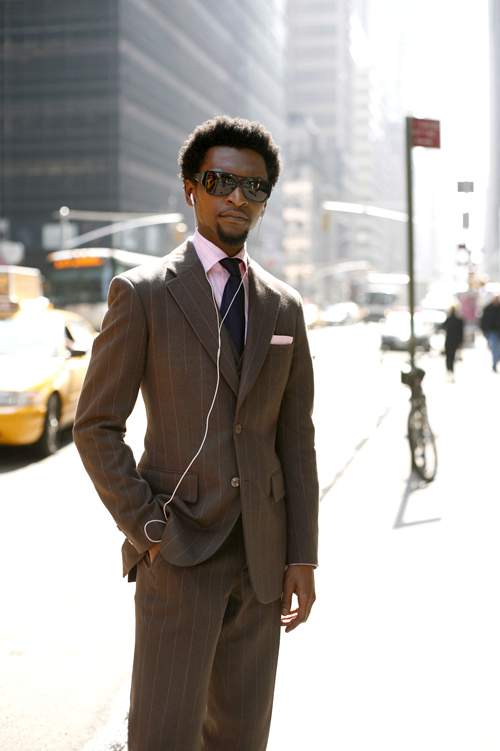 I love the lines on the suit (perfect), his hair, the earbuds, the sunglasses. That’s style. It reminds me of those DNKY adverts about 2 years ago – with the yellow taxies and the way he is dressed.. I agree with you, Sarto. This gentleman is drawing from an earthy pallette which suits his skin tones. I also like the retro hairstyle and the SuperFly shades which lend authenticity to the look. although i’ve long grown sick of seeing those white ipod headbuds EVERYWHERE, i gotta admit they give his outfit a smart, hip touch. like maybe he doesn’t take himself tooo seriously.. i wonder what kind of music he listens to! I love the photo of Thelonius Monk with the other musicians. He knew that when that picture was taken all the other jazz musicans would wear black- he purposely wore white to stand out- smart man. This is absolutely my favorite. While I don’t think anyone can out modern the inimitable Mr. Monk, this guy certainly takes an admirable run at it. I’m going to take this photo to my tailor to show him that buttons are moving up even on two-button jackets. Either way he makes it look good. love the suit and the shirt, but would’ve chosen another color or fabric for the tie – it’s the weak link. but he looks quite dapper. I love Sarto and many of the comments, but sometimes I get a tad tired of the black to black direct references, like weak Hollywood casting, I would expect more from folks who are real observers and lovers of style. I can see T Monk but some of the other references, Andre 3000? Again?! A hip black man in a suit = Andre 3000. Come on now. I also think that an Afro is both timeless and elegant, it no way limits what you can wear nor should it place you in a particular context. Afro and wrap shades = Superfly? So if you a blonde and wear cat eye sunglasses and scarf = Grace Kelly? Long brown hair and mini = Jane Birkin? That sounds more like supermarket tabloid fashion editorial than Sarto or maybe my standards are too high? thelonious monk?! 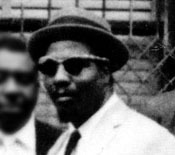 i take exception to the suggestion that someone ‘resembles’ the most unique and creative man in jazz merely on the basis that hes a sharp-dressed black man. I agree with a couple of other comments. Looks great but the stance and (infered) attitude say more Miles to me. oh baby. i LOVE when guys dress like this. he looks amazing. he looks like the guy in those tanqueray ads. I have a huge crush on him! Dear Mr Sart, have you ever thought, to start organising dates? There are surely huge interests on your subjects all over the world. This is a big niche. You forgot mention that the picture ist perfect too..love the correctly exposed guy in conjunction with the overexposed, blurred background. love it. I’ve tried to find you in his glasses (like in Blade Runner) but it is impossible! I think YOU are really the best, everywhere. saw this in GQ– I need this suit! Great suit. Love the colors and the fit. I think the Ipod, the sunglasses, and his hair make him look modern. Guess temo 9:19 pm has some issues!? “A blond with cat eye glasses and scarf = Grace Kelly” Absolutely! It’s about classic iconic images of style. Whoever it is. What a great looking guy, and a great looking suit. He just carries this off to perfection. Very cool cat. Wow, he looks really cool!He looks really classic but really modern too! I’m almost certain that I’ve met this chap. Always very dapper. So how did this thin guy get such a perfectly fitting suit? Just a thin cut? Tailor take in the waist? I’m somewhat thin and jackets are *always* too baggy on me. totally digging the brown and pink, especially with his skin tone. but it really is the hair and sunglasses that make the look. How slick is he. He really has chosen every element of his look perfectly hasn’t he. Even the earphones look perfectly placed. He seems to hold himself with utter class too – something too many people forget is vitally important to an overall image. I’m thoroughly impressed. Umm I saw that guy today?! That’s so funny. And I noticed his look too, since he totally stood out. Nice photo. i actually saw him in queens yesterday, getting out of the subway. classy fellow indeed. This guy’s name is Simba and he is a wardrobe consultant for Domenico Vacca on Madison Avenue. He deals with mostly high profile jet set types. I know this because he has helped celeb’s for the recent Oscars. Unfortunately he looks like an ad for Ipod. He sure does look like a modern day Thelonious. Great suit and combination. Inspiring, I'd say. Congrats from Brazil. Love to see men of color looking dapper. Simba is always always ALWAYS put together and has the funkiest style out side of work! He is such a gentleman! Love him!